World Sleep Society is issuing a global call to action about the importance of healthy sleep. Friday, March 16, 2018 is the 11th annual World Sleep Day®. Created and hosted by World Sleep Society, World Sleep Day is an internationally recognized awareness event bringing researchers, health professionals and patients together to recognize sleep and its important impact on our health. 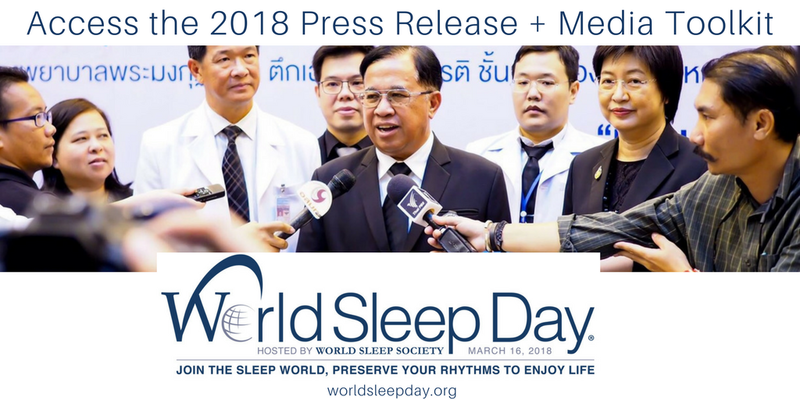 World Sleep Day 2018 will incorporate the slogan, ‘Join the Sleep World, Preserve Your Rhythms to Enjoy Life,’ intended to emphasize the importance of circadian rhythms in healthy sleep, and inspired by the recent Nobel Prize in Physiology or Medicine assigned to three researchers who have dedicated their studies to circadian rhythms. Circadian rhythms refer to cyclic events within the body such as rhythms in hormones, body temperature and alertness levels. Biological clocks from within the body produce circadian rhythms, but environmental factors such as sunlight also affect them. Preserving regular circadian rhythms have been found to lower the risk of sleep disorders, mental health disorders and chronic health issues such as obesity and diabetes. The 11th Annual World Sleep Day has partnered with Thrive Global, Westin Hotels & Resorts and Ferring Pharmaceuticals. More sponsors will be included before March. Ferring Pharmaceuticals recognizes the importance of a good night’s sleep and therefore promotes healthy sleep by raising awareness of nocturia, the need to urinate once or more at night. Sleep disturbances can have a significant impact on our health and well-being and might even be a sign of a more serious condition. During World Sleep Day, Ferring raises awareness of nocturia, a common cause of sleep disruption in adults of all ages. · Organizing an event to create excitement and generate interest in World Sleep Day. · Circulating the official press release with sleep experts and local media. · Distributing sleep patient literature such as booklets, leaflets and newsletters. · Finding other ideas at worldsleepday.org. · Spreading the word on social media about #WorldSleepDay. • Sound sleep is one of the three pillars of good health along with a balanced diet and regular exercise. • There are close to 100 disorders of sleep, but most are modifiable and manageable with the help of sleep specialists. • Effects of insufficient sleep favor outcomes such as increased appetite and enhanced sensitivity to food stimuli. • Next day effects of poor quality sleep include a negative impact on our attention span, memory recall and learning. • Studies suggest that sleep quality rather than quantity has a greater impact on quality of life and daytime functioning. • Short sleep duration appears independently associated with weight gain, particularly in young age groups. • Longer term effects of reduced sleep duration are being studied, but poor-quality sleep or sleep deprivation has been associated with significant health problems, such as obesity, diabetes, weakened immune systems and even some cancers. More statistics on sleep are available on worldsleepday.org. World Sleep Day is organized by World Sleep Society, founded by World Association of Sleep Medicine (WASM) and World Sleep Federation (WSF), an international association whose mission is to advance sleep health worldwide. World Sleep Society and the International RLS Study Group have collaborated to launch a sleep directory aiming to globally connect healthcare professionals and patients in their search for sleep experts at sleepdirectory.org. A job board has also been created for sleep medicine professionals on www.worldsleepsociety.org. Follow the excitement on Twitter @_WorldSleep and facebook.com/WASMF. Westin Hotels & Resorts, a leader in wellness and hospitality for more than a decade, empowers guests and associates to embrace well-being and be their best selves through the brand’s six pillars of Well-Being: Sleep Well, Eat Well, Move Well, Feel Well, Work Well, and Play Well. At more than 200 hotels and resorts in nearly 40 countries and territories, guests can experience offerings that include the iconic Heavenly Bed, RunWESTIN and Westin Gear Lending with New Balance, delicious and nutritious SuperFoodsRx™ and more: www.westin.com, @westin on Twitter, Instagram and facebook.com/Westin. Advancing Sleep Health Worldwide. Hosting #WorldSleepDay on March 15, 2019. Hosting #WorldSleep2019 in Vancouver, September 20–25, 2019.